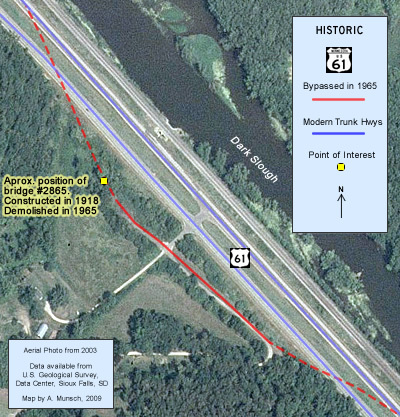 A tiny piece of the original 1920's era grade of U.S. 61 between Minnesota CIty and Minneiska survives today as a local road, accessible from the first cross-over north of Highway 248. 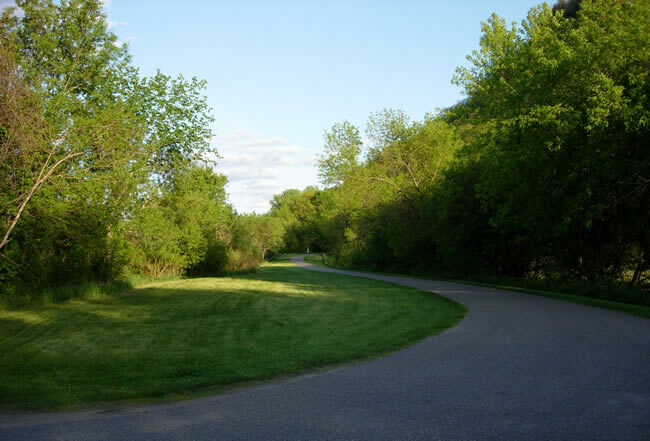 The road between Minnesota City and Minneiska was completed and paved with 18 feet of concrete in 1926. Bridges along the road had been constructed in earlier projects in 1918 and 1921. In 1965 the Department of Highways replaced the old concrete highway completed in 1926 with a new road that is now the southbound lane of the modern 4-lane highway. Much of the old road was left behind and closed to traffic until the modern northbound lane was constructed over it in 1978. The major exception to this was at a backwater of the Mississippi River just north of Minnesota City that was filled in order to straighten the highway. This allowed a short section of the old road to survive. As part of the project, it was converted into a farm entrance road and the surviving pavement was buried with gravel to reduce the need for maintenance. A bridge (no. 2865, constructed in 1918) near the north end of the alignment was demolished. Today, the farm entrance has been converted into a paved driveway on top of the old grade, now providing access to a few private estates. Photo Tour - Photos were taken in May, 2008. Looking southeast on the farm entrance road. Note the new driveway constructed on top of the old grade. Looking to the northwest. 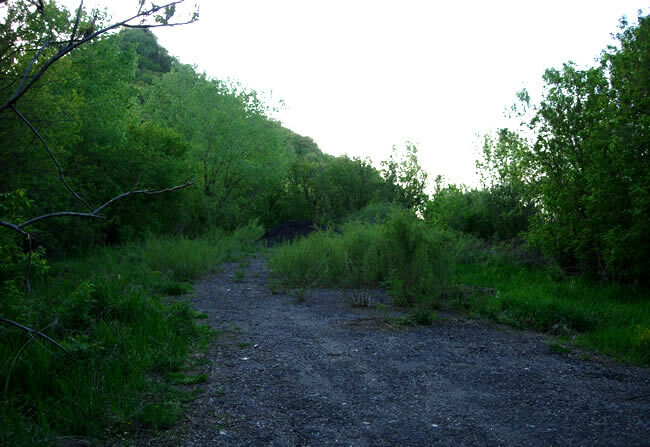 The old grade dead-ends just north of the access point from modern U.S. 61. Bridge #2865, constructed in 1918 over a local creek, once existed just ahead. It was demolished in 1965.